gives the value of expr determined by a symbolic solution to the ordinary differential equation eqn with independent variable x.
uses a symbolic solution for x between xmin and xmax. uses a solution for the partial differential equation eqn. uses a symbolic solution for a list of differential equations. uses a solution of the partial differential equation eqn over the region Ω.
DSolveValue can solve ordinary differential equations (ODEs), partial differential equations (PDEs), differential algebraic equations (DAEs), delay differential equations (DDEs), integral equations, integro-differential equations and hybrid differential equations. DSolveValue will return a single solution, whereas DSolve can return multiple solutions. DSolveValue can give solutions that include Inactive sums and integrals that cannot be carried out explicitly. Variables K, K, … are used in such cases. DSolveValue[eqn,y[Infinity],x] gives the limiting value of the solution y at Infinity. Boundary conditions for ODEs and DAEs can be specified by giving equations at specific points such as u[x1]a, u'[x2]b, etc. Boundary conditions for PDEs can be given as equations u[x,y1]a, Derivative[1,0][u][x,y1]b, etc. or as DirichletCondition[u[x,y]g[x,y],cond]. 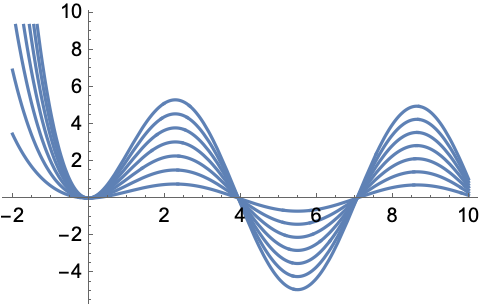 Initial conditions for DDEs can be given as a history function g[x] in the form u[x/;x<x0]g[x]. WhenEvent[event,action] may be included in the equations eqn to specify an action that occurs when event becomes True. The region Ω can be anything for which RegionQ[Ω] is True. N[DSolveValue[...]] calls NDSolveValue or ParametricNDSolveValue for differential equations that cannot be solved symbolically.